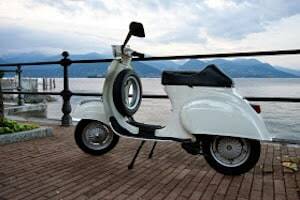 As a scooter accident attorney in Los Angeles , I know that scooters, mopeds, and other types of motor-driven cycles can be both fun to ride and an economical form of transportation but, can also be involved in crashes causing serious injury or even death. Let’s face it, L.A. is a high volume traffic city and motor vehicle operators can be both rude and dangerous to persons operating smaller motorized vehicles like Vespas or other scooters. Knowing how to protect yourself from being involved in a wreck and what to do if you are injured due to a negligence or wrongdoing or a violation of the rules of the road by another driver is crucial! Intersection collisions: By far the most common place for a crash to occur involving a motorized cycle is in an intersection. Red lights get blown through, distractions lead to rear end collisions for stationary scooter operators waiting for the light to change, cars make left hand turns in front of a scooter going straight, vehicle turn right and fail to see motor driven cycles coming through the intersection and many other scenarios. Losing control of the scooter: Sometimes these conditions are within the control of the scooter driver such as traveling at an appropriate speed or having sufficient training and experience but, sometimes motor vehicles come over on a motorized two wheel vehicle simply because they don’t see them. These types of incidents can cause the scooter to lose control and veer into curbs or lay down and crash. Driving under the influence of alcohol or drugs: People must keep in mind that, like any other “vehicle”, it is illegal to operate a scooter with any appreciable amount of alcohol (for those under 21) and with a blood alcohol content of .08 or higher (for persons over 21). Make Yourself More Visible: As with any vehicle that is smaller than a passenger car, lack of visibility is the number one cause of crashes ending in serious bodily harm or even death. Make yourself more visible by using your headlight, having reflectors, wearing brightly colored clothing, choosing lane location wisely, and avoiding “blind spots” such as riding along the rear and to the side of an automobile. Be extremely vigilant and aware of your surroundings at intersections: Driving defensively is always a good “rule of thumb” but, it is crucial when you are operating a smaller motorized cycle and approaching or passing through an intersection. Be cautious for the driver making that left hand turn or the one behind him trying to make the “tag along left turn”. California law requires drivers approaching a stop sign to stop completely at the limit line and yield the right of way to other drivers who have arrived before them. Just expect that cars and trucks will “skip” you and disobey this rule! Be cautious before entering the intersection! Ride Within Your Ability and Stay in Control: Whether your new scooter has a 50 cc engine or 150 cc engine or more, it is always best to take a training course prior to riding and to ride within your abilities. Traveling too fast, taking corners too quickly, lane splitting at higher rates of speed and other practices can lead to a crash. Scooter riders being hit by cars while crossing roadways or intersections. Scooter operators striking pedestrians on walkways or sidewalks. While both the Bird and Limbike apps have liability waivers built in, this would not negate the ability to file a claim for personal injury in the event a scooter rider is harmed by the negligence of a third party. The most common scenario here would be getting hit by a car while riding a Bird or Limebike scooter. If the motor vehicle operator was negligent, a claim for personal injury or wrongful death may lie against that driver. California is a comparative negligence jurisdiction, which means that even if the scooter operator was negligent as well, it would not preclude recovery. Oftentimes there is some fault apportioned to both sides. In addition, if scooter operators strike a pedestrian due to riding on a sidewalk in violation of municipal codes or under the influence, an action may lie for the injured pedestrian against the scooter rider. If a scooter hits a pothole or defective sidewalk, a premises liability cause of action may be viable if it can be shown that the property owner either knew or should have known about the defective condition. Stop and assess the scene and any injuries you may have incurred. Call 911 if you, a passenger or anyone involved has sustained bodily injury. Obtain information from each and every driver of any vehicle involved in the incident including driver’s license number, license plate number, type of vehicle, and insurance information (including name of insurance carrier, policy holder’s name [can sometimes be different than the driver], policy number and phone number for reporting claims). Report the accident to your insurance company as soon as possible. Prompt reporting of a claim is a condition for coverage on most if not all policies. Document the accident scene with photos (see my prior blog post on how to use your smartphone to document an auto accident). Seek prompt medical attention. Don’t refuse a ride to the E.R. in an ambulance if this is offered and you have any physical complaints of pain. Contact a competent accident and injury attorney familiar with scooter accidents! Steven M. Sweat, APC has been representing motorcycle and motor scooter accident victims in Los Angeles for almost 2 decades. We know that being struck on a small vehicle by a much larger motor vehicle can cause serious injury or death and we fight for the rights of accident victims to obtain maximum monetary compensation for medical expenses, lost wages, property damage and pain and suffering. Call our toll free Los Angeles accident and injury hotline 24/7 at 866-966-5240 or 323-944-0993 (Central L.A. office).